June Kittlety's fascination with bears began early. On her 4th birthday, her mother gave her a teddy bear which she named Ted. She still has Ted and although he looks worse for the wear from all the love she's given him over the years, that didn't stop Ted and June from celebrating her 60th birthday with a cruise to Alaska. "We both met lots of other bears when we would shop in the port stores and Ted sported a brand new wardrobe especially for the cruise." Sounds like Ted is a very lucky bear! As you can tell, June is an avid bear collector. 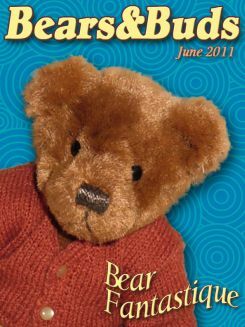 She started making bears after buying a teddy bear magazine while on holiday. She thought to herself, 'I can do that' and was instantly hooked. 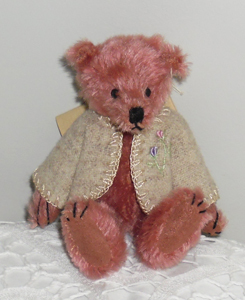 Now, 20 years later, under the business name of Bear Fantastique, she's still making bears and their accessories which she mainly sells in teddy bear shops, gift shops, through mail order and at bear shows held mostly in Australian major cities along with shows in Singapore and San Diego. A couple of years ago, June decided to move a small cottage from the mainland to Russell Island by barge and had it placed on a ridge above the water. Russell Island is one of a group of small islands in Redland Bay off the coast, between the Queensland's capital of Brisbane and the Gold Coast. With its subtropical climate, it makes it an ideal place for June to sit on the deck overlooking the ocean while she does her hand sewing. "We are fortunate to have kangaroos feeding on the grassland around us, kookaburras in the trees overhead watching and diving down for their next feed and the whistling kytes drifting quietly over our heads, waiting for something to move below." June's inspired by the abundance of wildlife that surrounds her, which adds to the pleasure of living in what could be called paradise. 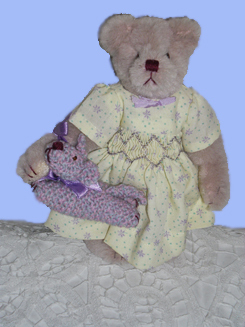 June keeps busy making an average of about 3 bears per week and has done so since she started making them. With her vast skills, she makes everything possible including knitting, crocheting, smocking, embroidery and has even, on occasion, spun the wool before knitting it. 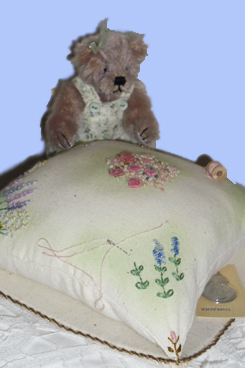 She's done a few needle felted bears too. 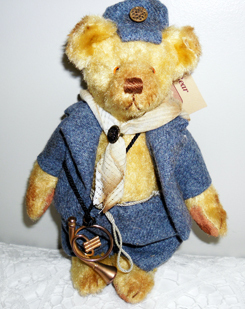 "I particularly like combinations of bears with sewing equipment. 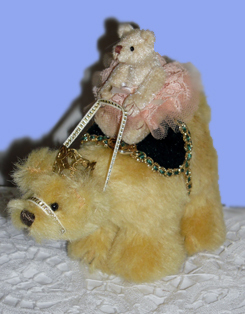 An example of which would be a bear on a scissors holder, a bear needle book, bears with pin cushions, etc." 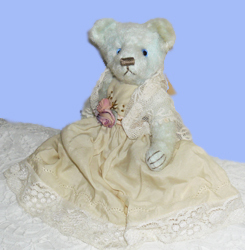 Over the years, she's also made a lot of commemorative bears; recognizing births, graduations and weddings. Some have even found their way marking events in her own family's life such as when her grandson had a knee operation to repair damage from a basketball mishap. "I made a teddy that included a hand made crutch, a basketball and bandage for the knee." What a wonderful gift for her grandson to know that she was thinking of him, wishing him a quick recovery and giving him a keepsake he can cherish forever. When her own children married, June used her bear making talents to add a unique touch to the wedding. "I made the table decorations which were of bears dressed the same as the wedding party." Not only did she create a special memento for her children's wedding, but others got to share in the love because after all the festivities were done, the bears then became the bride's gift for her attendants, creating new bear lovers along the way.